The IBM® DB2® Analytics Accelerator Version 2.1 for IBM z/OS® (also called DB2 Analytics Accelerator or Query Accelerator in this book and in DB2 for z/OS documentation) is a marriage of the IBM System z® Quality of Service and Netezza® technology to accelerate complex queries in a DB2 for z/OS highly secure and available environment. Superior performance and scalability with rapid appliance deployment provide an ideal solution for complex analysis. 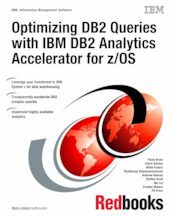 This IBM Redbooks® publication provides technical decision-makers with a broad understanding of the IBM DB2 Analytics Accelerator architecture and its exploitation by documenting the steps for the installation of this solution in an existing DB2 10 for z/OS environment. In this book we define a business analytics scenario, evaluate the potential benefits of the DB2 Analytics Accelerator appliance, describe the installation and integration steps with the DB2 environment, evaluate performance, and show the advantages to existing business intelligence processes.